tkCNC Editor is a text editor, specially developed for CNC code (G-code) editing for CNC machines. 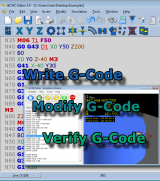 It is used by CNC operators and programmers for quick editing and proof of CNC code. - Operations with CNC code registers such as: renumbering, mirroring, translation, 2D or 3D rotation, mathematical operations (+,-,*,/), sorting etc. tkCNC Editor has been tested by Download82.com team against viruses, spyware, adware, trojan, backdoors and was found to be 100% clean. Our editors will recheck this software periodically to assure that it remains clean.